In 2003, you and your cousin Massimo took control of the family business after starting in the workshop in 1993. Have your customers changed over the years? Of course. When I started my career in the family workshop, we were known as a classic, serious, discrete, almost confidential house. At that time most of our clients were 50-year olds who dressed in bespoke, whether because of family traditions of because of their body shape. Back then, we made a lot of suits, but we had far fewer clients. 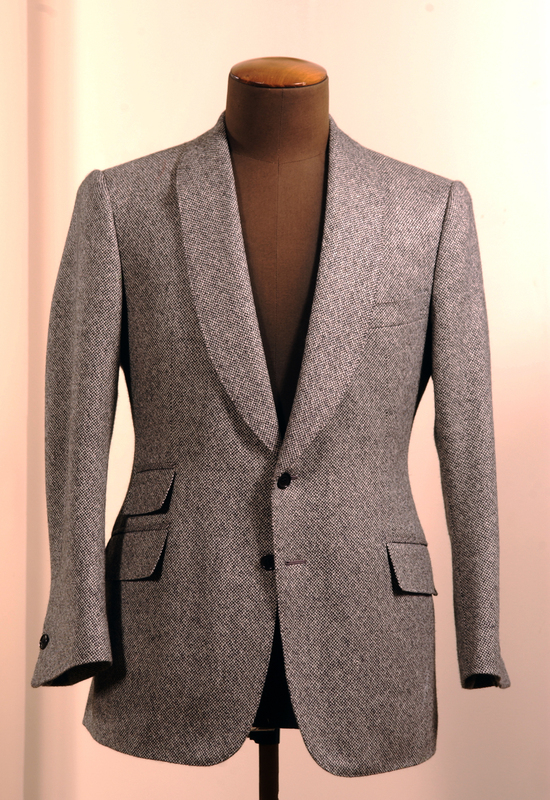 For instance, we often made 10 or 15 suits for one single order. Nowadays, even though we still have a few very loyal clients that order several suits, our clientele is much more diverse in terms of age and income. Who are these new clients? They have been getting younger every year. They don’t choose bespoke out of necessity or because they can afford to, but because they want to. Unlike our traditional clientele, our new clients are around their 40s and only order a few pieces every year. However, they are much more demanding in terms of sartorial awareness and education. Some guys in their 30s even come to us for their first bespoke suit. Very early on, these guys are trying to create their personal style and venture into bespoke very thoughtfully. Their demands in terms of style and customisation cannot be compared with what we saw in the 1990s. Do you think this new clientele emerged from a natural market trend or was it triggered by Cifonelli being more open to a contemporary style? There really is a trend for customisation and gentlemen are more and more aware of all aspects of personal style. However, I think that the decline in our clients’ average age has more to do with us becoming more open to bolder and more modern lines, and more aware of the new needs of modern gents. When my cousin and I took the business, we started to travel a lot to expand our client base in Japan, the US and some European countries. Both of us were 35 at the time. At that age, you’re always more sensitive to trends and, most importantly, to the needs of your new clients. They are demanding, always on the go, and not willing to compromise on elegance, no matter how, when and where they were their suits. This is how we gradually modified the cut and the lines without touching the fundamental elements of our reputation. Where does the Cifonelli line come from? My grandfather was trained in cutting in England at the beginning of the century. Very quickly, he learned how to blend the British technique and his Italian sensitivity. Soon after he moved to France, he added a French touch to his style, and the Cifonelli signature style was born. By the way, we still take all measurements in inches. Let’s get into details. Part of the Cifonelli signature is the shoulder. Karl Lagerfeld says he can recognise it 100 meters away. It is true that the shoulder is very important to us and that ours is quite particular. It is very bold and forward, to streamline the silhouette without losing the masculine and manly aspect. To make this type of shoulder, we have to use our own construction technique, which we have been using for decades [the sleeve is felted wet with an iron before stitching]. Although it is our most famous hallmark, there is a lot more to the Cifonelli style. Our suits have a rather small chest, and the jackets are cut smaller at the front than at the back. The line is always our ultimate priority. It must streamline the body and be very masculine. 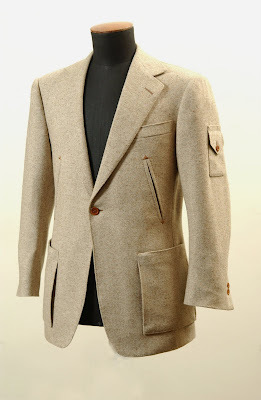 Details and finish are equally important: we always stitch the buttonholes with Milanese rolled thread (difficult to use) and are quite particular about lapels: we position the notches quite high. 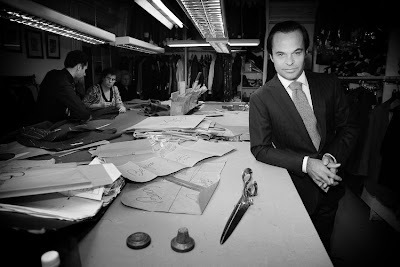 Right now our 35 workers [the largest bespoke team in France] on Rue Marbeuf make about 800 suits every year. We recently developed a line of very original sports jackets that has brought us to a completely new clientele that is more open to bolder pieces. 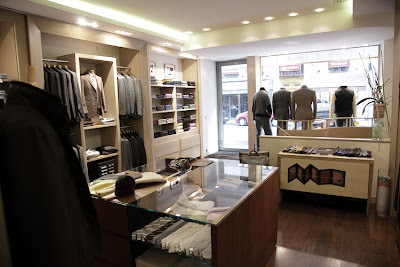 In 2007, you reopened the store below the bespoke workshop on Rue Marbeuf. It offers traditional ready-to-wear and made-to-measure. What prompted this decision? The idea of renovating and reopening the store was simple: access a broader clientele and offer high-quality traditional pieces at good prices. Even though it’s not bespoke, it is the same Cifonelli quality and the standards are just as high. 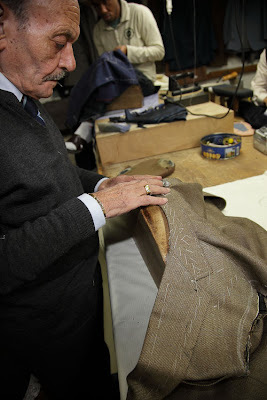 We draft the patterns for suits and coats that are then assembled in Parma in an excellent traditional workshop. The close proximity of the boutique and bespoke workshop gives clients access to a wide array of fabrics and offers them alterations and finishing that meets our standards. So for about €2,000 euros they can get a quality suit and a taste of the Cifonelli experience. 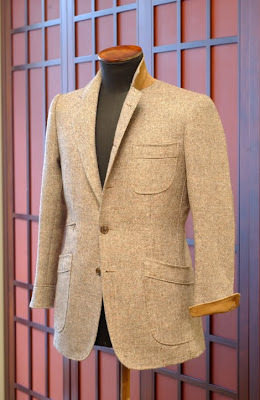 We are seeing connections between the boutique and bespoke as well. Some clients move on to bespoke from our high end RTW. So there is a genuine consistency in the approach, even if the two client bases remain fairly different. It takes money to move up to bespoke but more importantly you need a lot of patience, a rare quality in the 21st century. You can follow the discussion on An interview with Lorenzo Cifonelli by entering your email address in the box below. You will then receive an email every time a new comment is added. These will also contain a link to a page where you can stop the alerts, and remove all of your related data from the site. The interview mentioned expansion in the US, but didn’t specify who exactly carries their line. Any clue Simon? Thanks.